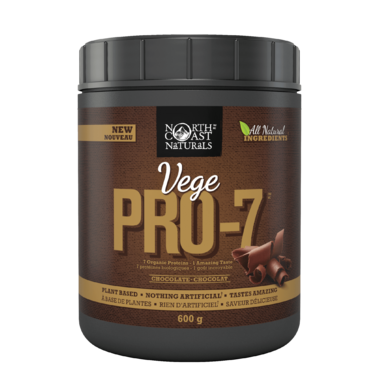 North Coast Naturals Vege PRO-7 has been specially formulated with 7 organic proteins, 1 amazing taste and nothing artificial. It features super foods like organic bio-fermented whole grain brown rice, organic sprouted chia, organic Canadian hemp protein, organic pumpkin seed and other nutrient-dense proteins. Getting enough protein is always a concern when you're not consuming animal products. Vege PRO-7 takes out the guesswork and offers a delicious solution for anyone looking to add more protein to their diet. Developed to provide a clean source of fuel for those who want to eat vegetarian, avoid common food allergies or with other dietary restrictions, making it simple to get the nutrition you need. Not only that, it tastes so good you'll actually look forward to drinking it every single time! This stuff tastes so much better than some other protein powders I've tried. Some add way to much stevia but this is perfectly balanced. Clean ingredients too! After trying the vanilla powder, I bought chocolate as well. Now, I alternate between the two of them, they are both excellent. I may actually prefer vanilla, but this is just personal preference. I use them in a ball shaker for quick on the go breakfast (and they are very tasty this way). If you add it to a vitamix, you will literally not be able to detect there's a protein powder in it at all. Sooo smooth and creamy. This brand blows away all the other vegan powders I've been using (which all tend to be at least a little bit gritty/chalky). I don't think I need to experiment any more. This vegan powder is perfect. Well worth a try if you're looking to get extra protein in your diet or after a work out, but have struggled with finding a tasty smooth option in the past. Nice taste! Chocolate flavour is delicious, but the vanilla is not nice at all.